The button at the end of the epaulette next to the collar has an "A" in its shield for artillery. 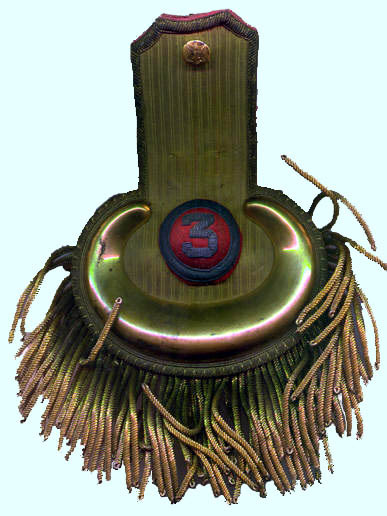 There is no grade device on the strap of the epaulette indicating the officer held the lowest grade that of second lieutenant. Within the cresent of the epaulette is a domed type circlet in red for artillery. The embroidery of the circlet is in silver to contrast with the gold of the epaulette. The bullion tassels are one-eighth inch per regulation. The three within the circlet indicates third regiment of artillery but could be of the Regular Army or of one of the states. In addition, it could be heavy artillery or light artillery. Within the field armies light artillery regiments of eight to twelve batteries each existed only as administrative units and the force was deployed by attaching individual batteries to ever larger infantry units. Originally the batteries were attached to brigades but by the end of the war it was by corps. The result was that the light artillery regiments did not develop the individual identities possessed by regiments of the other service branches.